Image source: Alaska Wood Carvings. Click image for link. I had originally begun drafting this post as a follow on to Trouble at the Waterworks, which recounted how the significant rains of 1867 sent piles flying and reduced LA’s zanja system to carted water. These rains offer some insight to just how gnarly a 500-year storm could be, something that circulates in the news from time to time. It’s worthwhile to appreciate how much these rains can shift our rivers, when the human hand isn’t busily doing it, that is. Driving that shift: loads of debris from the mountains washing down. Rainy weather always puts me in mind of the historical oral histories taken down by James Reagan in 1914. They highlight how dramatic, dangerous, and long cross-county travel could be – travel that today makes us irate and grumpy when it take a few hours. The New River mentioned here is the San Gabriel River, in its “new” channel. It shifted course in the 1860s. S.P. is Southern Pacific (rail road). The trip, 25 miles from Downey to Santa Ana. We took off with the mattress flopping on the roof and headed west past the Irwindale rock quarry, following the old Baseline Road through lemon groves and vineyards. The honeyed smell of lemon blossoms seemed confusing right then. The strange fear I was carrying didn’t seem to mix with the surrounding nature: a mockingbird in full raucous song; the pulsing mist of irrigated rain. The loud headers on the flathead Merc rumbled through the floorboards, out into the immaculate aisles of lemon trees and oranges. I had a definite sense of somehow being a passenger in an evil vehicle cruising through Paradise. I had no idea how I’d come to be there. A coyote ducked off between the trees and headed for a deep ditch: a beautiful red coyote with a big ruff. He turned toward us and stopped a second, taking in the chopped and channeled Mercury with a burnt mattress flapping on the roof, then slipped away between the smudge pots and rain birds. > If you haven’t read Josh’s article yesterday about the urgency of action to prevent the county’s astonishingly wrong-headed plans for burying Arcadia’s oak woodlands – read it and take action! Demolition is scheduled to begin next week. Here’s a set of links of yesterday’s blogger solidarity day post to save this irreplaceable site: Altadena Hiker, ArcadiaPatch, Ballona Blog, Bipedality, Breathing Treatment, Chance of Rain, Echoes, Greensward Civitas, L.A. Creek Freak, L.A. Eco-Village, L.A. Observed, Pasadena Adjacent, Pasadena Daily Photo, Pasadena Real Estate with Brigham Yen, Slow Water!, The Sky is Big in Pasadena, Temple City Daily Photo and Weeding Wild Suburbia. Thanks also to Sierra Madre Tattler! > Oiled Wildlife Care Network reports an oil spill in the Dominguez Channel on December 22nd 2010. Their team “recovered three oiled birds: one Pied-billed grebe, which died, and two American Coots.” As of January 4th, OWCN reports that “no responsible party has been identified, and the source of the spill remains unknown.” Full story at link. > ArroyoLover reports on the drawbacks (pun intended) of new archery range fencing proposed for Pasadena’s Lower Arroyo Seco Nature Park. > L.A.’s Daily News reports a Shadow Hills incident where a “car raced downhill, bouncing over speed bumps before brushing by horse and rider, spooking them to the curb. [The horse was] injured [and ultimately perished] when she became trapped in a storm drain debris screen[…]. The driver did not stop.” Interestingly the article calls for changes to the storm drain trash grates, but seems to let the criminal speeding driver off the hook. Full story at link. > If you think L.A.’s La Niña rains were bad, read Circle of Blue‘s reports on disastrous El Niño rains in Colombia and Venezuela. > The Los Angeles Times has an impressive photo of water churning through the San Gabriel Dam during recent tests. Also at L.A. Times: environmentalists file suit to block Newhall Ranch development imperiling the Santa Clara River. And, further afield, plans for the future health of the Klamath River. > The Project For Public Spaces has an extensive conference proceedings document that serves as a sort of handbook for waterfront design/place-making. Their top recommendations (as distilled by me) are: multiple destinations, connected by trails for walking and bicycling. > The city of Los Angeles Bureau of Sanitation hosts a Low Impact Development update on Thursday January 20th 2011 at 1pm at their Media Center Offices. Details at L.A. Stormwater Blog. > Los Angeles Times L.A. Now blog reports that the L.A. City Attorney is seeking an injunction against 10 members of the Metro Transit Assassins. Their massive “MTA” graffiti art piece on the concrete wallks of the Los Angeles River stretched from the First Street to the 101 Freeway in Downtown Los Angeles. Their monumental tag was painted out recently – through a program funded by federal stimulus monies. > The Downey Patriot reports that the city of Downey has approved plans for a new dog park, to be located on the San Gabriel River. The pull quote comes from Councilmember Roger Brossmer: “I’m all for the Lassies of the world, but I’m worried about vicious dogs.” The new park will be immediately upstream from Rio San Gabriel Park, which is just upstream of Firestone Boulevard. > I really enjoyed the above Ted.com talk by Ellen Durham-Jones. She talks about the the “underperforming asphalt” in suburbia (mainly excess parking surrounding declining big box stores and malls), and how we go about Retrofitting Suburbia. Listen all the way to the end of the 20-minute talk to hear about her conclusions that some of our suburban development can be densified, while other parts of it can become more natural – including daylighting of creeks and 1000-foot buffers on stream corridors! I look forward to reading her book: Retrofitting Suburbia: Urban Design Solutions for Redesigning Suburbs. > Riparian Rap begins a new series examining errors in the way artists depict rivers and creeks. He calls these Geomorphically Incorrect Art. So far there’re part 1 and part 2. 1 – An America’s Great Outdoors Initiative listening session will take place from 6pm to 8:30pm on Wednesday July 7th 2010 at the Whittier Narrows Recreation Area in South El Monte. They’re requesting email rsvps by July 2nd. See details here. 2 – The second local America’s Great Outdoors Initiative listening session will be from 3pm to 7pm on Thursday July 8th 2010, at Occidental College in Eagle Rock. They’re requesting email rsvps by July 1st – today. See details here. > On Spring has opened at the site of Sam’s Lunch, adjacent to Los Angeles State Historic Park. The restaurant offers healthy yummy food. Mainly open at lunchtime (hours Tues-Sat 11am-3pm.) The park is once again the site of archeological explorations… but there’s still plenty of park open for use! 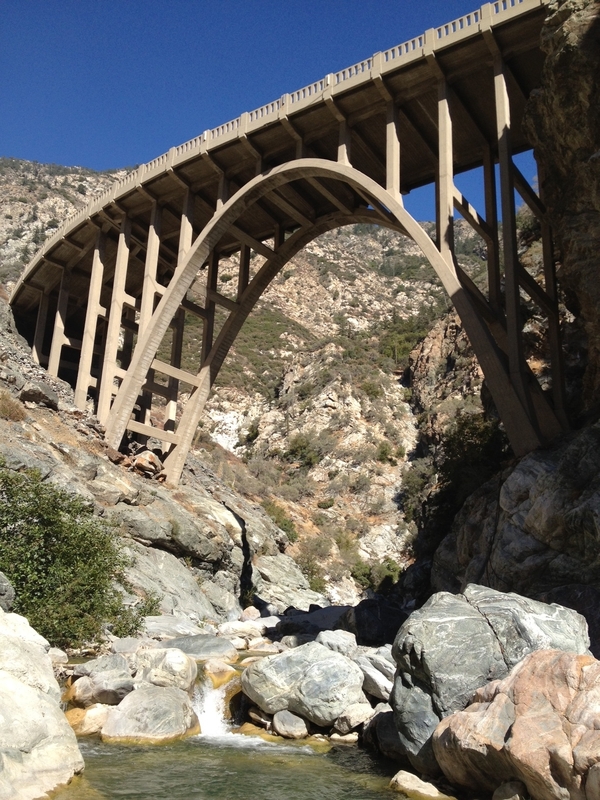 > Are stronger federal protections on the way for the San Gabriel River and the San Gabriel Moutains? L.A. Times’ Louis Sahagun reports on recent efforts. > On Thursday June 24th the city of L.A. hosts a couple of public River Revival meetings where you can get the latest on the city’s riverly revitalization. Same meeting repeats 1pm-4pm and 6pm-9pm at the L.A. River Center and Gardens at 570 West Avenue 26 in Cypress Park. See flier for information. 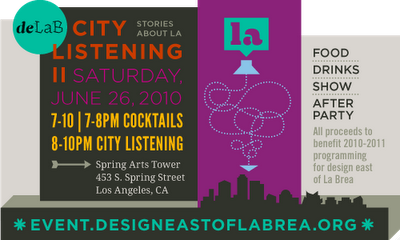 > Creek Freak’s Joe Linton will among many excellent speakers at de LaB’s City Listening II at 7pm on Saturday June 26th 2010 at Spring Arts Tower, 435 S. Spring in Downtown Los Angeles. For more information and to purchase tickets go here. Anyone who arrives by walking, riding their bike or taking public transportation receives a very special walking-themed door prize! > Creek Freak’s Joe Linton will give a talk on the Los Angeles River at 2pm on Tuesday June 29th 2010 at L.A. County’s Culver City Julian Dixon Library as part of their Make Waves at Your Library Summer Reading Program. The library is located at 4975 Overland Ave., Culver City 90230. > L.A. and San Gabriel Rivers Watershed Council hosts Harvesting the Rain: Decentralized Stormwater Management seminar from 9am-4pm on Wednesday June 30th 2010 at the Autry National Center. Includes afternoon tour of Elmer Avenue. > The city of Glendale hosts a public meeting for input on future phases of their Glendale Narrows Riverwalk project – including a planned bridge connecting bicyclists and pedestrians to Griffith Park. The meeting is at 6:30pm on Wednesday June 30th 2010 at Glendale’s Grayson Power Plant at 780 Flower Street, Glendale, CA 91201. See Creek Freak background on the project here. You are currently browsing entries tagged with San Gabriel River at L.A. Creek Freak.